When we got married and came to Chennai,the first place we went to was our friend V's house.Our house wasn't ready and we had not got the keys,so we stayed at his place for about a week.His family was out of station too.We reached at his place from Bangalore,early morning.We sat and talked for a while and V said he'll make tea for us.Me,being the new bride,all set to impress my hubby and his best friend,took up the plunge and said I will make tea and breakfast too(!!! ).I made tea,which was a disaster,as I used up the entire packet of milk(1/2 ltr),it was tasty,only thing,it tasted similar to a milk based sweet(!!). ;-).I am sure what hubby must have gone through at that moment..hehe.I could see pity for him in V's eyes..;-). I had to salvage my pride and how!V told me that there is dosa batter in the fridge and chutney powder in the shelf,he was so very tensed whether I knew to make dosas..! !Anyway,I kept quiet and waited for them to get busy reading the newspaper and scanned the kitchen.There was a rack which had potatoes and onions and Yay!! I knew how to impress them.I set about making masala and while it was getting cooked,made chutney-put the dosa tava on gas and called them for breakfast.I should say they were stumped! !The expression on their faces was worth a watch.Till date,I don't know whether it was because the masala dosa was tasty or because they couldn't believe I could whip up such a breakfast after the disastrous tea!!! Whenever I make masala dosa I make this Ulli chammanthi too-Chutney made using small onions.I love the flavor that this chammanthi imparts to the dosa along with the masala! !So here's the star dosa which salvaged my pride..Masala dosa it is!! In a pressure pan/cooker,add the oil and splutter mustard seeds. Add the green chillies,ginger and curry leaves and stir well. Add the onions and saute till they become translucent(not brown). Add the potatoes,haldi and salt to taste-mix well. Mash the potatoes a little and add the coriander leaves. In a kadai,add the oil and shallow fry the onions till they become light brown. Add the chillies and tamarind and fry for sometime. Remove from the kadai,add coconut and salt to taste and grind to a smooth paste in a mixer. Drizzle with coconut oil and keep aside. Keep in a warm place for fermenting,overnight. Heat a greased dosa tava on flame and pour a ladle full of dosa on to the pan and spread it well. Cover and cook it on medium flame. Apply ulli chammanthi on one half and masala on the other. I would have been stunned too Divya. You really make it sound so easy!! I've had a go & making dosas many a time...yours are very impressive! I like the chutney too...YUM! 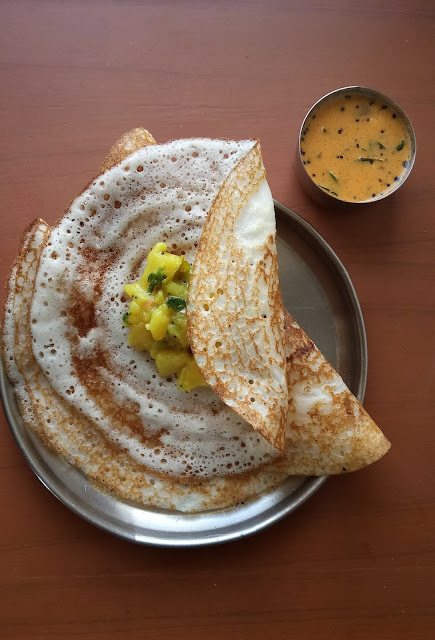 the dosai looks really crunchy and anytime masal dosai is a welcome thing. You have captured it very well. MAking consistently good tea is never my cup of tea ;)Even after 4 yrs of being married, i get stumped if i have to make tea for a lot of people. Dosa and chutney look superb! chutney with small onions sounds good!!! Bhags..thank you.Right said about tea-it doesn't quite work when you are trying to impress;-)!! Shreya..thank you.I manage well now,compared to the full-milk tea,anything called tea would taste ok;-)!! Deeba..thank you.The only thing I could make before marriage was dosas and chapathis,which saved me that day!! Srimathi..thank you.Even I love having masala dosas anytime of the day!! Tee..thank you.Same here,I still have to measure milk and water in cups and sugar in tsps per cup if I have to make tea for many people,unlike my mother who somehow manages to make the exact quantity required even without measuring!! Cynthia..Oh yeah,it was worth a watch;-)!! Sowmya..it tastes great with masala dosa!! I can never make a decent tea!! Your dosa-chutney-potato masala looks awesome. I will make that chutney soon. Looks great. Loved the write up, reminds me of the first tea I made for my then fiancee and now hubby, in front of everyone he asked me if it was sharbat or Tea. Nice to read your first time cooking experiences..